Head downtown and share the love with our many unique small businesses! Print out the Hometown Holiday Scavenger Hunt flyer below and play along for a chance to win great prizes from participating businesses! Planning out your holiday shopping strategy? 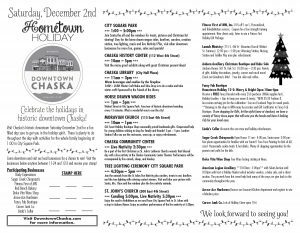 Remember to grab your Hometown Holiday Flyer and play along in the Hometown Holiday Scavenger Hunt! It’s a great way to experience all downtown Chaska businesses have to offer while getting the opportunity to win great prizes from the businesses! Simply print out the flyer and come visit each of the 9 businesses for a stamp. Turn in your cards at Hometown Holiday or the Fireman’s Park Tree Lighting for a chance to win great prizes! Scavenger Hunt Businesses: Fancy Fab Boutique, Body Expressions, Sugar Creek Chiropractic, Fitness First of MN, Red Bench Bakery, Dolce Vita Wine Shop, Arrow Ace Hardware, Carver Junk Co. and Linda’s Cellar. Time to come downtown and celebrate the 11th annual Hometown Holiday. 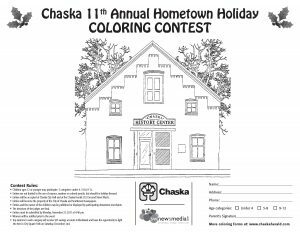 In preparation sharpen your crayons and complete the coloring contest for a chance to win the honor of lighting the tree in City Square Park! Make sure to also check out the agenda for the big day and check back daily for more surprises about the event and all the fun leading up to it!